Sean Rafferty presents, with live music from cellist Mischa Maisky and all-star trio Henning Kraggerud, Natalie Clein and Christian Ihle Hadland. Plus opera director Barrie Kosky. Sean Rafferty presents a lively mix of music, chat and arts news. 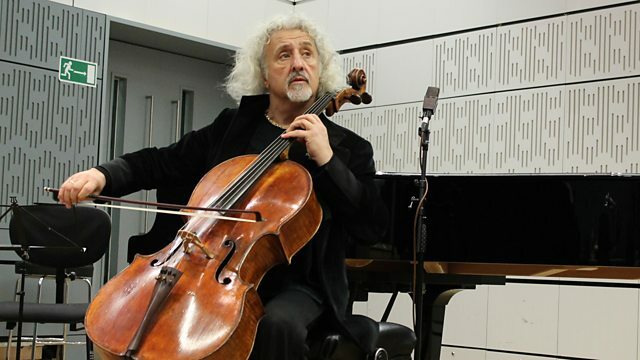 His guests include opera director Barrie Kosky, whose production of Bizet's Carmen opens tomorrow at the Royal Opera House, and cellist Mischa Maisky, who performs live in the studio. Plus an all-star piano trio made up of three Europe's finest soloists: violinist Henning Kraggerud, cellist Natalie Clein and pianist Christian Ihle Hadland. Performer: Lisa Batiashvili. Music Arranger: Tamas Batiashvili. Orchestra: Chamber Orchestra of Europe. Conductor: Yannick Nézet‐Séguin. Choir: Choir of Trinity College, Cambridge. Orchestra: Orchestra of the Age of Enlightenment. Conductor: Stephen Layton. Performer: Maxim Vengerov. Orchestra: Israel Philharmonic Orchestra. Conductor: Zubin Mehta. Paganini, Saint-Saens, Waxman: Works for violin and orchestra: Vengerov. Choir: RIAS Chamber Choir. Orchestra: Concerto Köln. Conductor: René Jacobs. Singer: Bryn Terfel. Orchestra: London Symphony Orchestra. Conductor: Barry Wordsworth. Choir: Alamire. Conductor: David Skinner. Performer: Hakon Hogemo. Orchestra: Bergen Philharmonic Orchestra. Conductor: Edward Gardner. Music Arranger: Paul Sikivie. Singer: Cécile McLorin Salvant. Performer: Aaron Diehl. Performer: Paul Sikivie. Performer: Lawrence Leathers. Ensemble: Catalyst Quartet. Conductor: Reinhard Goebel. Orchestra: Musica Antiqua Köln. Johann David Heinichen Dresden Concerti Musica Antiqua Koln Reinhard Goebel. Performer: Henning Kraggerud. Performer: Natalie Clein. Orchestra: BBC Philharmonic. Conductor: Rumon Gamba.